Scroll Down We have this Monthly List that goes out to Our Customers, at times it is listed on Digit Smith, along with much of our equipment for sale. Let us know what you are looking for, or if you have any questions on the equipment listed. For pictures you can see them on this sight. If you do not see what you are looking for give us a call at 413-536-2480 or e-mail us at thorntonec@charter.net and we will send you information and photos. 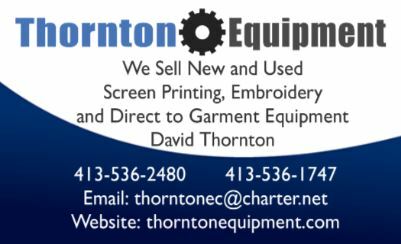 thorntonec@charter.net and we will list your equipment. 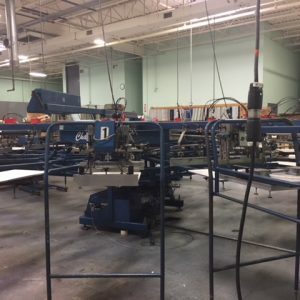 We Specialize in NEW and Used Screen Printing, Heat Presses, DTGs, Flatbed Presses, and Embroidery Equipment . Take a look at our Website at thorntonequipment.com for the equipment listed here and other equipment we have for sale. 1 Set of Adult 16×20 Pallets, 6 Sets of Floodbars and Squeegees, No Flash(es), 1,855,000 Prints, Average 825 Prints Per Day, Located in NC….$13,000. TAS 201R Series Automatic Press- 1994, 6 Color, 8 Station. Very Dependable. Excellent Condition. Capable of printing 200 to 1,000 pieces per hour. 2) TAS’s Just IN, 1)2004 1)2005 Ask us about them. Not listed on website yet. Vastex V-2000 HD-6 Color, 4 Station-2012, Holds Accurate Multi Color Registration, Pallets: 4) 15 x 17 4) Single Sleeve 4 x 19 4) Leg Pallets 5 x 24, 4) 6x 6 with quick clamps NEW PRICE $7600. Priced at $4500. Vastex DIGIT Number System- 2012, Number Font: 4”, 6”, 8”, 10”. 12”, Screens without line screens All Squeegees and HD Gas, Springs to Print Number….$2200. Vastex Big Red 4-V30 Dryer- 4 Heater, Dual Zone Heat, Single Phase….$5500. Hix Manual 4 Color 4 Station–Standard Pallets…$1600. M&R Red Chill Quartz Spot Dryer-20 x 24, 36 Amps, 208/230 V, 3 Phase….$3600. Brown Quartz Flash- 2012, 20x 24, 35 Amps, 240 V, Single Phase…$2300.